Welcome to Big Dog Land Services LLC Roll Off Dumpster Rentals! We make renting a dumpster easy and affordable. We're open 24/7 and deliver 7 days a week for your convenience. We currently offer 11 and 13 yard dumpsters. Our dumpsters are a perfect size for homeowners and contractors of many different trades. Our dumpsters are also perfect for small to medium residential and commercial renovations, along with house, garage, attic or basement cleanouts and property cleanups. Our pricing is straight forward with no hidden fees. 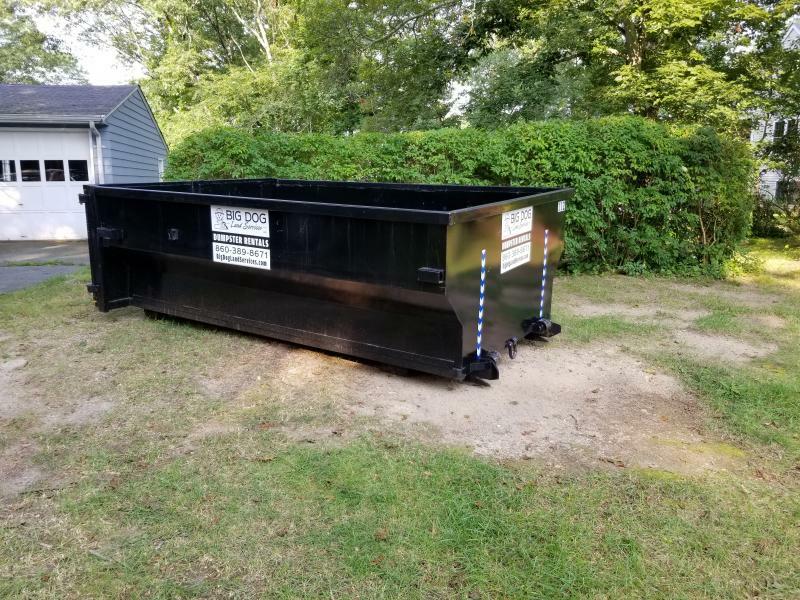 An 11 yard dumpster measures 12' long x 8' wide x 4' high with barn style rear doors for easy loading and holds about 4 full size pick-up trucks worth of debris. 7 Day rental for either size dumpster $150.00 delivery and pickup plus weight. *Weight charges are billed at 6 cents per pound. Yard waste is billed at $60.00 per ton with a ton minimum. Payment is due upon delivery. If you can not be present during delivery then payment must be made prior to delivery. Need the dumpster longer? We charge $5.00 per day starting at the end of your rental period. Don't want big and/or heavy trucks on your driveway or property- not a problem! We use a small rolloff trailer towed by a pickup truck, which gives us the benefit of having a much lighter foot print on our customer's property. When the dumpster is loaded on the trailer, this set up distributes the weight over a much greater area, reducing the ground pressure of our vehicle on your property. Especially when compared to a large rolloff truck carrying a dumpster on it. Our dumpsters also have barn style rear doors. Two 4' wide doors instead of one 8' wide heavy door like other companies. Working or living in an HOA, Condo units, Appartments and/or just have no room for a dumpster? We offer "Live loading". We will bring a dumpster to you, wait while you load it, and when your finished we will take it right off site. "Live Loading" is provided at additional cost. Need assistance loading? We can provide that too at an additional cost. Everything you dispose of with Big Dog Land Services gets recycled, even your yard waste! Call us today to schedule your dumpster delivery or to reserve one for later.